An exceptional meditation on nature and “soul-life,” republished after many years out of print and contextualized for modern minds. In a dusty Maine bookstore, writer Terry Tempest Williams (When Women Were Birds) and her husband, Brooke Williams, picked up an unfamiliar book that they quickly came to love: The Story of My Heart by English naturalist Richard Jefferies, originally published in 1883. 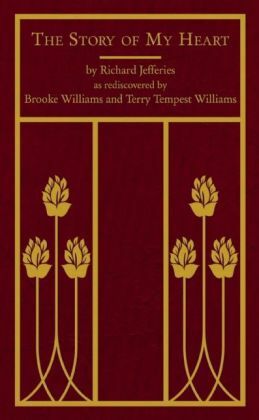 As Brooke writes, “classic works of literature need to be rediscovered and reinterpreted every age for their clues to contemporary issues.” This new edition of Jefferies’s autobiography includes an introduction by Terry and Brooke’s commentary following each chapter. Don’t be fooled by its small size. This is a book to be taken slowly and savored, because all three of its wise and pensive authors demand and deserve careful consideration. Here is Walden, but more mystical, and with no room to criticize the author for returning to wealthy drawing rooms between his stays in the woods. Jefferies has been characterized as a nature writer and a mystic; in Brooke’s words, “Jefferies writes less specifically about the natural world surrounding him, but in great detail the path his mind takes through that original world.” The Story of My Heart is a philosophical, wondering and wandering, musing, personal ode to the natural world and human potential. The Williamses make his contemplations relevant by analysis–for example, applying the context of climate change–but also explore a more intimate connection, as Brooke ponders the nature of his obsession with this book. Both literal and spiritually minded readers can appreciate this remarkable collaboration through the counterpoint of Brooke’s responses to each chapter and the timeless thoughts in the original work. This review originally ran in the November 18, 2014 issue of Shelf Awareness for Readers. To subscribe, click here, and you’ll receive two issues per week of book reviews and other bookish fun! Rating: 9 leaves of thyme.